There is no end to the litany of self-proclaimed social media experts. Do you know what an expert is? A drip under pressure. That can also describe the “social media expert” who waves their MBA, snags a job with a big corporate agency, and is fired six months later because the client says their Facebook isn’t working for them. These are the people who have have no photo in their Twitter profile, have 3 followers, and their last tweet was in 2012. The reason digital media (I dislike the term “social” because it is too limiting in a growing technology) doesn’t work is for one reason and one reason alone: you’re not doing it right. But that’s okay, because unless you seriously drop the ball on a PR disaster and make it worse, it is never too late to change your ways. But even after a PR fail, it is still possible to set yourself upright. Screw the numbers, organic is the only way to go. If you really want to grow your digital community, you need to be real. Follow real people who post real meat that you want to read or feel confident in sharing with your own real community. You will start small. 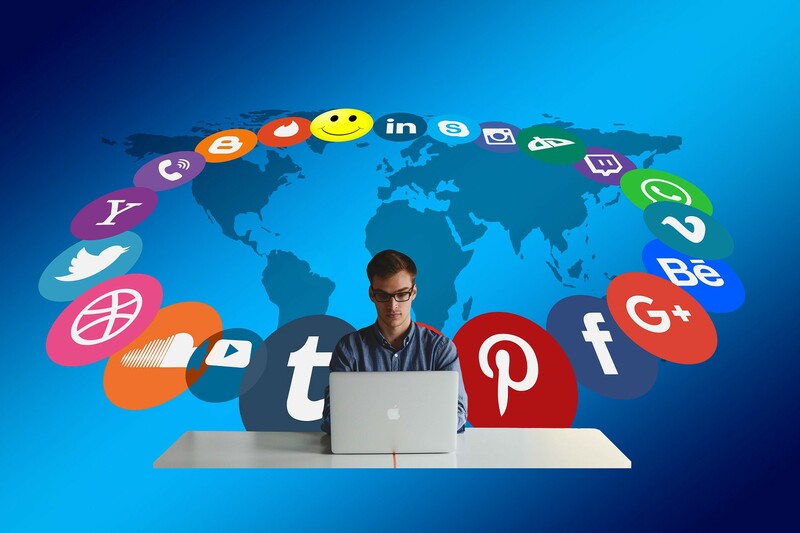 But if you plan your editorial guideline, follow the right people, share the right content the right way, you can grow your 10 Twitter followers into 300 in just a couple of months. That may not sound like much, but that is 290 more people in your direct personal network than you had before. They become followers because of YOU. They like what you post and you seem interesting to them. A few will be bots and Twitter will periodically clean them out, which is why you see the numbers go up and down. Be consistent and don’t sell, sell, sell, but rather share, share, inform, share, educate, share, educate, and then you can sell in a respectful way. Do that, and your community is more apt to grow organically, meaning people will follow you and follow you back when they see that you provide value in their feed. There are true digital leaders who are approachable and inspire on every post. Approachability is everything in digital media. Your profile and posts show others how approachable you are. Do you say thank you, respond in real time to inquiries? These all add to your digital cred. The names at the top of the digital thought leader list have expanded over time but some of them are still there, such as Guy Kawasaki, Brian Solis, Gary Vaynerchuk, and Erik Qualman. There are many other digital thought leaders who do not always receive the recognition the digital pioneers receive. These are the people I want to share with you here, the ones you also need to follow and learn from. Lynn Ponder is the founder of www.webcitygirls.com, a multicultural site that covers entertainment and lifestyle from a social media point of view. She is an #unstoppablelatina. She developed the first bilingual interactive digital platform. Web City Girls’ trademark on celebrity red carpets and events is a signature styled pink wig. 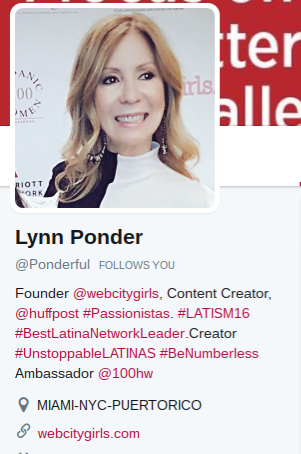 Telemundo and Latin We selected Ponder as a Top 100 Influencer in the U.S. Hispanic Market and Latin America. 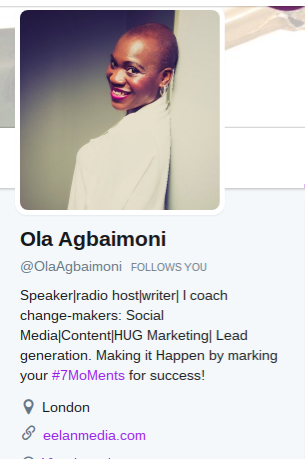 Based in London, UK, Ola Agbaimoni’s digital media philosophy is HUG Marketing: hearing, understanding, and giving back. She does that daily in her posts. She is the founder of Eelan Media and is known as The Business Detective. She was ordained in 2006 as an interfaith minister, completed the London Marathon, and has a 2nd Dan Black Belt in Tae Kwon Do, which makes her uber cool, too. 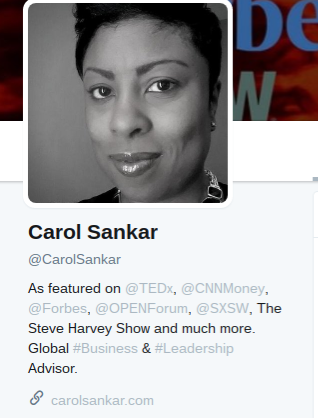 Carol Sankar pulls no punches when she directs her conversations to women. It is her way to build The Confidence Factor to create high level female leaders. She has several books under her belt and has been featured in many high profile media programs. 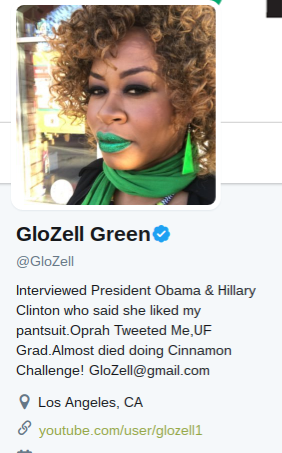 GloZell Green cut her teeth on creating her persona on YouTube, where she has over 4.5 million subscribers. The Queen of YouTube has even landed two of the most high profile interviews one could ever get: with President Barak Obama and Hillary Clinton. Her Glo All In docu-series with the Awestruck Network features her struggle with fertility and motherhood. She has also appeared in a number of films. 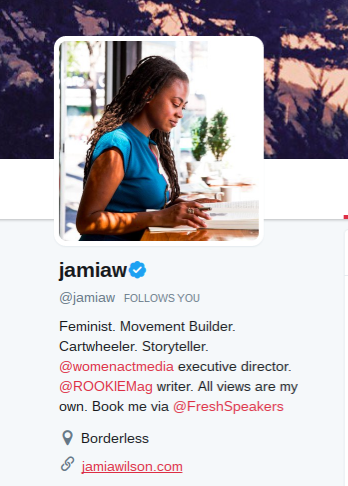 Jamia Wilson is the executive director of Women, Action, and the Media, a movement dedicated to gender justice in the media. As an activist, she has become a strong force in social justice and women’s rights. She was named in Refinery 29’s “17 Faces of the Future of Feminism,” and she speaks to colleges nationwide about race, feminism, and leadership. Daniela Castellanos is a storyteller on steroids. 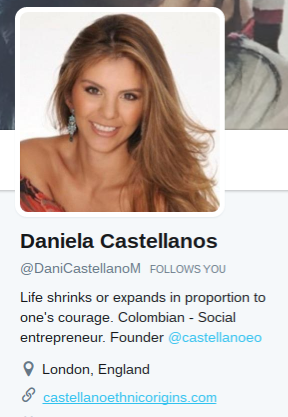 She founded Castellano Ethnic Origins to be more than a place to purchase handbags and fashion accessories. She showcases the Columbian artists who create them in an effort to preserve and support indigenous culture. The Castellano Foundation develops social programs that help reduce poverty and provide education to improve living conditions for traditional artists in Columbia. 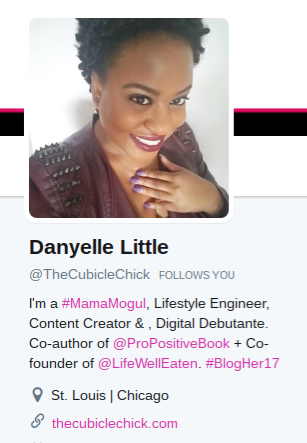 Danyelle Little is The Cubicle Chick. This former human resources manager has been recognized as a top entrepreneur and social media influencer in St. Louis, Missouri. She is the 2014 winner of ALIVE Magazine’s Best Use of Social Media. Her blog site has turned into a movement for working parents and entrepreneurs. She has co-authored two books with Mr. Think Positive, Telie Woods. You don’t have to look search too hard to find a good person to follow. The women featured here are some of people who inspire my social feeds every day. I know that whenever one of their posts shows up in my feed, it will either inspire me, educate me, entertain me, or motivate me to action. These are the type of people I like to follow. They are always teaching me something I can use in my own life. Facebook, Twitter, YouTube, and other digital platforms are just that: platforms. They are the tool, or the vehicle you use to send your profile or business to the masses. The media platforms will not create miracles. They will not determine your success or failure. That fate lies on you. How you portray yourself, what you post, how you respond and communicate with others is amplified to the masses. Be the person that others want to follow.